Cheesy and delicious, this is a go-to meal for special occasions. It's looks like you've made a lot of effort, when in reality, it's actually quite easy! 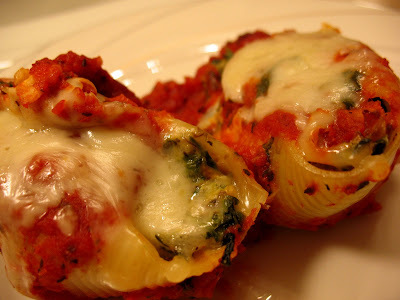 I love the cheesy filling with bits of prosciutto and spinach, all bathed in a tomato sauce. So yummy! In a pot of boiling water, cook the pasta shells for about 7-8 minutes or until the are still slightly undercooked. Drain, rinse under cold water, and set aside. Using a fry pan with a bit of oil, saute the onion until it is soft and translucent. Remove from the heat and stir in the prosciutto, ricotta, egg, nutmeg, pepper, spinach, and half of the fontina cheese. Stir well. Spread about 1 cup of spaghetti sauce in the bottom of a 13x9 inch pan. Using a spoon (or your fingers, it's so much easier), stuff the shells with a rounded tablespoon of filling. This must be why I never get 32 shells, because I stuff those babies full. Use your own judgment. Set the stuffed shells on the spaghetti sauce in a single layer. Once you've stuffed all the shells, top them with the remaining spaghetti sauce and sprinkle with the rest of the fontina cheese and Parmesan. Cover the dish with greased tin foil so that the cheese doesn't stick to the foil, and bake at 350 F for 30 minutes. Let sit for about 5 minutes before you serve it once you remove the dish from the oven.